This lesson will show you how to split a long lesson into smaller lessons. Breaking your lessons up into smaller sections will make your lessons easier to keep up to date. Select the step that you want to be the first step of the new lesson. 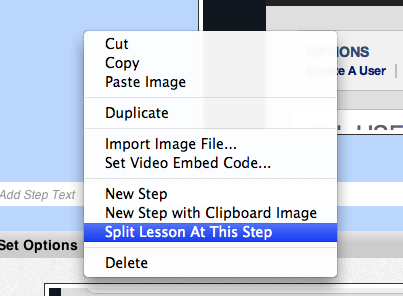 Right click on the step (not the image) and select Split Lesson At This Step. This is what will happen. 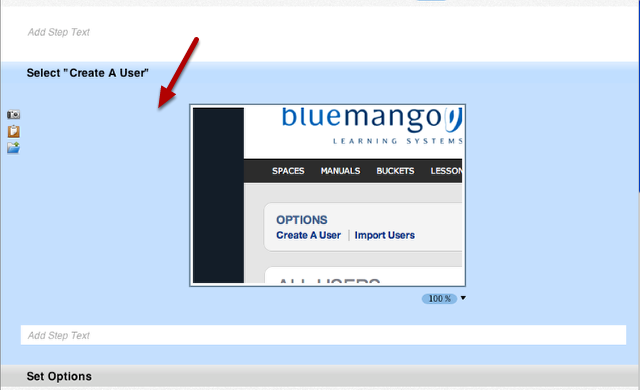 The step that you clicked on and all steps after it will be removed from the current lessons. A new lesson will be created with the step you selected as the first step of that lesson. I want to unsplit a lesson but don't think it's possible? Right after you split the lesson you can use the Edit menu to undo the action. The menu should read Edit > Undo Split Lesson. Other than that there is not. We don't have a function that will append one lesson onto the end of another. It would be really useful to be able to merge lessons into one. Are there any plans to do this? Can this be achieved by copying one lesson and pasting onto the end of another (as a workaround)? @Steve: As of version 2.8.7 there is no good way to merge lessons. All you can do is copy and paste one step at a time. We do have plans to make moving content around easier in future versions, however.